Naval Minewarfare involves both Mining and Mine Countermeasures (MCM). There is a continuous battle of wits as each side develops new weapons and the opposing side attempts to counter them. Offensive - mines laid in enemy territorial water or waters under enemy control to deny him free use of his sea lines of communication or access to his own ports, harbours and anchorages. Defensive - mines laid in international waters or international straits with the declared intention of controlling shipping in defence of sea communications. Protective - mines laid in friendly territorial waters to protect ports, harbours, anchorages, coasts, and coastal routes. Tactical - mines laid for a specific purpose or operation or as part of a formation obstacle plan laid to delay, channel or break up an enemy advance. A common definition of a sea mine is an explosive device laid in the water with the intention of sinking or damaging ships or submarines. Generally, sea mines are actuated either by physical contact with a target (contact mines) or by sensing the presence of a target because of some influence it generates (influence mines). Mines come in all shapes and sizes. They range from the familiar spherical steel 'coin-in-the-slot' moored mine collection box found on seaside promenades to stealth shapes that lie on the seabed and blend with their surroundings. Mine cases can be made of steel, aluminium or even Glass Reinforced Plastic (GRP). Normally, bottom (or ground) mines contain larger amounts of explosives than moored mines because they do not need to be positively buoyant or bear the weight of a cable anchoring them to the seabed. Moored mine - positively buoyant and can be anchored to lie just beneath the surface of the water or at any other chosen depth. Bottom mine - negatively buoyant and remains on the seabed waiting for targets to approach close enough to be destroyed. Also called a ground mine. Mobile mine - designed to be propelled to its intended lay position by propulsion equipment like a torpedo. It sinks at the end of its run and then operates like a mine. Oscillating mine - hydrostatically controlled to maintains a pre-set depth below the surface of the water independently of the rise and fall of the tide. Homing Mine - fitted with propulsion equipment and homes on to its target, possibly using a torpedo motor or rocket. Mines can be laid by various platforms including aircraft, surface ships, submarines or small boats. The Greeks are credited with developing the first sea mine c.668 BC. They set fire to barrels of 'Greek Fire' (sulphur, naphtha, nitre and possibly phosphorous) and floated them on the tidal stream towards enemy ships. In 1585 Antwerp was besieged by Spanish forces under the command of the Duke of Parma. Under the guidance of Federigo Giambelli, an Italian military engineer, the Dutch defenders drifted two ships of 60 and 70 tons filled with casks of gunpowder to destroy the bridge providing access to the town from the sea. One of these exploded and made a 200 ft wide breach in the bridge besides killing more than 1,000 attackers. The same method was reputedly used against the ships of the Spanish fleet. In 1776 David Bushnell's one-man submersible The Turtle was steered across New York harbour by Sergeant Ezra Lee who tried to screw a clock-delayed explosive charge into the keel of Lord Howe's British flagship, the 64-gun HMS Eagle. However, he was foiled in his attempt owing to the ship's copper sheathing. In 1777 Bushnell floated a large keg of explosive fitted with a trigger device against the 32-gun frigate HMS Cerberus. The charge was carried past Cerberus but blew up and sank a schooner anchored astern. In Jan 1778 Bushnell floated a large number of explosive-filled kegs towards the British fleet at night but ice slowed their progress and it was daylight before they drew level with the ships which had been warped into the wharves. In what was possibly the first mine countermeasure operation, the British sent small boats to intercept the kegs but one of them exploded and killed a boat's crew. It was during this experience that Francis Hopkinson, a signatory of the Declaration of Independence, wrote a poem entitled 'The Battle of the Kegs'. The mines that Bushell deployed were surface drifting contact mines not significantly different from floating contact mines in use today. In 1797 Robert Fulton built a submersible called Nautilus with an explosive charge on a spar attached to the bow. He offered it to the French to use against the blockading British fleet but they turned him down, reputedly because they considered that striking an unsuspecting enemy from underneath was unethical. Fulton tried the Dutch without success and then tried the French again. This time, they funded the building of Nautilus II with which he sank a small vessel during a demonstration but things went no further. Fulton approached the British and conducted several experiments but his underwater methods of attack were seen as counter-productive for a nation that already controlled the seas with its surface fleet. 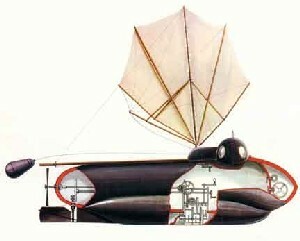 By 1810, he had devised several versions of a submerged contact mine that could be anchored on the sea bed. During the War of 1812 the Americans laid what was possibly the first defensive minefield in order to keep British ships out of New York harbour. By the end of the war the Americans used mines so extensively that British ships had to remain offshore. During the Schleswig-Holstein conflict (1848-1851) the Prussians used electrically-controlled mines to protect Kiel harbour from the Danish fleet. During the Crimean War (1854-1856) the Russians laid minefields to defend the Baltic harbours of Sveaborg, Kronstadt and Bomarsund and the Black Sea port of Sevastapol. Some of these used controlled mines detonated via cables from the shore but the vast majority were moored contact mines, (submerged wooden casks filled with gun powder) fitted with chemical horns. Immanuel Nobel (father of Alfred Nobel) and Moritz Jacobi of St Petersburg (inventor of galvanic technology) are credited with inventing these mines. They used mechanical and electro-mechanical detonators including lead horns, each containing a glass ampoule of sulphuric acid held within a mixture of potassium chlorate and fine sugar. When the horn was crushed, its contents produced a chemical reaction producing heat and flame to set off the main charge. The success of later contact mines owed much to the invention of the Hertz horn. This is a glass vial of electrolyte contained in a hollow lead horn. On being struck by a vessel, the Hertz horn crushes and allows the electrolyte to come into contact with two terminals in the firing circuit and thus actuates the mine. This is much more reliable than a 'switch horn' which easily corrodes and it provides a long-lasting source of electricity to power a detonator whereas a battery decays over time. The Hertz horn is still in common use today. A similar type of horn, sometimes attributed to Professor Jacobi of Petersburg, had already been invented by the father of Alfred Nobel. This comprised a lead horn encapsulating a glass phial containing sulphuric acid around which was a mixture of potassium chlorate and sugar. When the horn was crushed, its contents produced a chemical reaction producing heat and flame to set off the main charge. During the American Civil War (1861-1865) the Confederates made extensive use of mines in harbours, bays and rivers. On 12 December 1862, the ironclad Cairo was the first major US Navy ship lost to a mine. 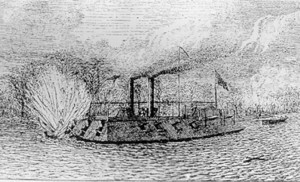 Operating in the Yazoo River in Mississippi, Cairo was destroyed by a mine triggered by a shore side Confederate team as she attempted to support mine-spotting boats moving on the river in front of her. On 5 August 1864, Admiral Farragut led a United States Navy attack into Mobile Bay. Upon being told that three rows of mines (then commonly called torpedoes) faced his ships he ordered "Damn the torpedoes! Captain Drayron, go ahead. Mister Jowell, full speed." Apparently his ships survived because the Confederate mines had been in the water so long that their actuation mechanisms had corroded and failed to function. During the 20th century great strides were made in the development of mine sensor systems intended to detect the presence of suitable targets. These are not only meant to ensure the mine actuates against the right target but also to make the mine actuate close enough to the target to sink or damage it severely. Mining barrages were laid by the Allies and the Germans in both world wars particularly at each end of the English Channel, the North Sea, the approaches to the Baltic and across the Greenland-Iceland-UK gap. In the Far East, the Americans and the Japanese laid many mines during WW II but mines were also laid by German surface raiders and U-boats in both world wars as far apart as the US eastern seaboard and the coasts of Australia and New Zealand. During WW I, the British laid 116,000 mines and the Americans laid 56,000 mines in the North Sea and English Channel alone accounting for 150 enemy war vessels and naval auxiliaries including some 35 U-boats. Worldwide, British mines are reckoned to have sunk a total of 1,047 enemy vessels and damaged a further 541. The Germans laid 43,636 mines worldwide including 1,360 minefields containing 25,000 mines in British waters. These are reckoned to have sunk 46 major RN warships, 259 merchant ships and 63 fishing vessels and damaged a further 84 merchant vessels. A total of 586 Allied merchant ships representing 1,000,000 tons is thought to have been lost to enemy mines. During WW II, the British laid over 185,000 mines for protective purposes in all theatres of war and over 76,000 mines (nearly 55,000 by aircraft, 11,000 by fast minelayers and destroyers, 5,500 by Coastal Forces and 3,000 by submarines) in enemy waters. These are reckoned to have sunk 1,050 Axis warships and merchant ships and damaged a further 540. The Germans laid over 120,000 mines and 30,000 minesweeping obstructors in north-western Europe alone plus many more in the Mediterranean. These are reckoned to have sunk 281 British warships of all types and 296 merchant vessels (521 Allied merchant ships altogether). In the Pacific, American mining is reckoned to have sunk 266 Japanese ships and British mining to have sunk 24 Japanese ships. More recently mines have been laid with significant consequences by the North Koreans during the Korean War, by the Albanians prior to the Corfu incident, by the Americans during the Vietnam War, by the Argentinians during the Falklands War and by Iraq and Iran during the various Gulf conflicts. A ship or submarine's influence on the earth's magnetic field provides a useful means for detection by a mine. This was achieved with a coiled rod unit in many types of moored and ground mines and, more recently, with the use of a tri-axis magnetometer. Other mine sensors include: active and passive acoustic transducers or microphones; pressure sensors that can detect the bow wave and stern wave of a vessel and fire the mine during the reduction in pressure between the two when a target is directly overhead; seismic sensors that detect vibrations on the seabed caused by vessels; antennae that detect a metallic object; Underwater Electrical Potential (UEP) sensors that detect galvanic action between dissimilar metals; and even photo-electric sensors. These sensors are often used in combination, first to wake the mine up because a potential target is approaching and secondly to actuate the mine if the target comes near enough to be damaged or sunk. This two-stage approach not only economises on battery power but also complicates the job of the minesweeper. Delayed rising mechanisms for moored mines whereby they can lie on their sinkers on the seabed and then rise to their set depth either after a set time delay or after the passage of a chosen number of targets. Anti-countermining devices that prevent mines from actuating in sympathy with other mines exploding or the use of explosive mine countermeasures. Delayed arming whereby the mine only wakes up after a selected amount of time has passed. Ship counters that only allow the mine to actuate after a set number of targets have passed. Modern electronic sensors and signal-processing enables mines to be programmed to look for targets having specific signature characteristics and reduce the risk of being swept by influence minesweeping systems. Stealth shapes have been adopted for ground mines such as the Swedish Rockan and Italian Manta in an attempt to thwart minehunting. Mobile mines were also developed during the latter part of the 20th Century. These can be launched from stand-off positions several miles away from their eventual laying position. Homing mines have been developed such as the US Encapsulated Torpedo called 'CAPTOR' that can lie dormant on the seabed for several months and then detect and chase a target when it comes within range. The Chinese EM-52 does the same but much faster because it is equipped with rocket propulsion. Offensive MCM - Prevention of mining. Defensive MCM - Reducing the risk from mines already laid. Strategic bombing of enemy mine factories, depots, airfields, harbour installations, etc. Sinking or shooting down mine-laying platforms. Excluding enemy mine-layers from areas of operations. Minehunting (Acoustic, Magnetic, Optical, Electro-optical, etc). Routing of shipping through 'safe' channels and areas. Rapid dissemination of navigational warnings. Material SPMs - Shock-hardening, signature reduction, ensuring watertight integrity, padding sharp corners, securing loose gear, etc. Personal SPMs - Wearing of protective headgear and life jackets, remaining above waterline, lying prone when off-duty, etc. Minesweeping is a form of defensive active MCM and can involve mechanical sweeping (towing wires and cutters to sever moored mines from their sinkers or chain sweeps dragged across the seabed) or influence sweeping (using magnetic, acoustic and pressure sources to actuate or jam mine sensors). Most sweeping techniques in use today involve sweep devices towed behind a surface ship or helicopter or incorporated in remote-controlled drones. Minehunting is also a form of defensive active MCM but was developed much later than minesweeping. The following paragraphs relate the history of these two forms of mine countermeasures. During the American Civil War, the first known ship mine-protection device is thought to have been employed. This involved the use of a wood and bamboo 'cow catcher' projecting 20 to 30 feet from the bow of a ship. This cow-catcher or 'torpedo rake' was attached to USS Saugus and used during the James River Operation. The US Navy also experimented with nets extending from all sides of a ship to protect it from contact mines. In 1870 the US Navy established the 'Torpedo Corps' and experimented with both defensive and offensive naval mines. Organized by Admiral David Porter, this group developed a system of mine countermeasures. In 1881 Captain Thomas Selfridge became head of the US Navy Torpedo Corps. His own ship USS Cario had been sunk by a mine during the Civil War. He started work on a system for ship defence against both mines and self propelled torpedoes. Captain Selfridge is credited with the first attempt to develop an effective mine countermeasures unit within the US Navy. At the turn of the century, the Russians were credited with the first attempt to sweep a mine field. Two ships steaming parallel courses towed a 2-inch thick cable between them to drag mines clear of a fairway. The cable was weighed down to keep it at a fixed depth. In December 1907, two Grimsby trawlers were hired by the Admiralty with their fishing crews and sent to Portland for experiments. The first trials, carried out against a field of dummy moored mines with a sweep not unlike an ordinary fishing trawl towed between the two vessels. The sweep was adopted for use and the first of 6 ex-torpedo gunboat minesweepers was commissioned in 1908. A senior officer was appointed to the Admiralty to conduct further experiments and to develop the system more fully. In 1908 Lt (later Capt) C L Lambe RN proposed the trial of an experimental cow-catcher fitted to a battleship. This comprised a number of booms carrying a transverse horizontal steel bar projecting ahead of the ship at keel depth with a net fitted above the bar. The trial was not approved because the design was considered too heavy and complicated. Also, unsatisfactory results had been experienced with similar gear in the Dardanelles in 1878. In 1911 the British fitted cowcatchers to torpedo gunboats and trawlers used as minesweepers. In 1913 a trial was conducted using a false bow, representing a torpedo gunboat, fitted to an old vessel called Mastiff. A guncotton charge of 501 lbs was exploded beneath the gear and it was subsequently approved for torpedo gunboats. At the beginning of WW I, British regular minesweeping forces comprised 10 ex-torpedo gunboats fitted with the Actaeon or 'A' sweep in 1908/95. These were HM Ships Speedy, Circe, Hebe, Jason and Leda of the Alarm Class and HM Ships Gossamer, Seagull, Skipjack, Spanker and Speedwell of the Sharpshooter Class (called the Gossamer Type after conversion). HMS Circe had been built in 1892. The first British (and Allied) naval loss occurred in the early hours of the third day of the war (6 August 1914) when the new 3,500 ton light cruiser HMS Amphion was sunk by a mine laid off the Suffolk coast by the German auxiliary minelayer Königin Luise. Königin Luise had been pursued by Amphion and destroyers of the 3rd Flotilla and sunk by HMS Lance the previous day (5 August 1914), thus becoming the first German naval loss of the war. By 8 August 1914, 94 fishing trawlers had been mobilised and converted for minesweeping. By 22 Aug, a further 100 trawlers had been commandeered and fitted out. By the end of the war, British minesweeping forces comprised 726 vessels including 110 regular naval vessels (mostly Acacia Class, Azalea Class, Arabis Class, Hunt Class and Aberdare Class Fleet Sweeping Sloops), 412 trawlers, 142 drifters, 52 hired paddle steamers and 10 Dance Class 'Tunnel Tug' shallow draught minesweepers. 214 British minesweepers had been lost in action while sweeping over 30,000 mines. Early British minesweeping was limited to the towing of a ground chain from two spars set across the stern of a vessel but this resulted in an extremely narrow swept path and the chain was easily snagged by seabed obstructions. The next development was a serrated wire sweep towed between two ships. Otter boards, used by fishermen to keep open the mouths of their nets, were employed to increase the width of the bight of wire in contact with the seabed. This simple design frequently became snagged on rocks and wrecks on the seabed but technicians based at HMS Vernon overcame this problem with the introduction of redesigned otter boards known as kite otters. These were not only used to divert the ends of the sweep laterally but others could be rotated 90 degrees and used to depress the ships' ends of the sweep wire to a chosen depth. This was the basis for the British Type Actaeon or 'A' sweep used for almost all Royal Navy minesweeping operations during WW I. It was effective for depths down to 50 fathoms. Later in the war, technicians at HMS Vernon developed an improved technique that could be used by one ship alone. This led to the Fleet accepted design in 1919 of a single ship wire mine sweep named the Oropesa Mk 1 after the Fleet minesweeping trawler involved in the trials. This system avoided the need for ships to operate in pairs. The Oropesa sweep was held at the correct depth by a kite otter and taken out on the quarter of the sweeping vessel by another kite on its side or by an otter board supported by a float. A 'V' cutter was secured to the end of the sweep wire to sever the mooring cable of any mines that had not already been cut by the serrated sweep wire. 'Campania' Gear (Director Naval Construction Type). SCW Gear (Superintendent of Contracts). In view of the potent German mining threat in the North Sea, Admiral Jellicoe called for minesweepers to proceed ahead of the Grand Fleet but he soon realised this would severely reduce the Fleet's speed of advance. He therefore urged the introduction of a minesweeping device that could be fitted to Fleet units themselves. Commander Cecil V Usborne RN of the battleship HMS Colossus proposed trials of an apparatus that could deflect any mine not encountered head on. It comprised two sweep wires, each fitted with a 'hydro-vane'. This was originally conceived by Lt Dennis Burney RN of the destroyer HMS Velox to deflect an experimental anti-submarine device clear of the ship towing it. When 'hydro-vanes' were secured to the ends of two sweep wires, they diverted the tail ends out from each side of the ship. Ultimately, this minesweeping device became known as the 'Paravane' and was fitted to the bow of all larger Royal Navy ships and many merchant vessels. In September 1914 the Turkish commander responsible for the defence of the Dardanelles closed the narrow strait with minefields. In August 1915 Vice Admiral Guido von Usedom (a German officer assigned to the Turkish as 'Inspector General of Coastal Fortifications and Minefields'), was sent to inspect the defences. Von Usedom expanded the Turkish mining effort and created a defensive minefield of over 300 German 'Carbonit' moored contact mines in eleven lines protected by the fixed guns and searchlights of forts and 74 mobile artillery pieces. In December 1914 the British approved an operation to open the Dardanelles using naval forces. They used 21 former North Sea trawlers converted into minesweepers and manned by civilian fishermen. These operated in pairs about 500 yards apart sweeping with a single 2.5 inch wire and a one-ton twelve foot long kite to keep the wire at depth. British minesweeping was ineffective on the first eight nights owing to strong currents and enemy fire; the trawlers repeatedly withdrew under harassing fire from enemy gun batteries and one was mined on 10 March. This led to a daylight operation which again saw the converted minesweepers withdraw under fire. On 18 March 1915, a major Fleet attack was attempted in order to silence the Turkish coastal guns. The minefields caused the loss of the British pre-dreadnoughts HMS Irresistible and HMS Ocean and the French pre-dreadnought Bouvet and inflicted severe damage on the battle-cruiser HMS Inflexible. Two more British capital ships were lost from gun fire. 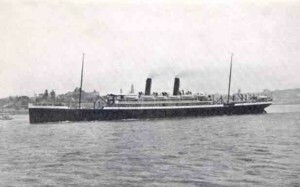 The British thought the mine losses were due to floating mines but the losses were actually caused by a new and undetected line of moored mines laid by the small Turkish steamer Nusret on the night of 7/8 March. At the outbreak of WW II, the Royal Navy only had about 40 Fleet minesweepers. Half of these were 'Smokey Joes' i.e. WW I coal-burning sweepers laid up at Malta and Singapore. By D-Day, there were over 1200 RN minesweepers of various types in operation including Algerine, Halcyon and Bangor Class Fleet minesweepers, British American Minesweepers (BAMS), Motor Minesweepers (MMS or 'Mickey Mouse'), British Yard Minesweepers (BYMS) as well as numerous converted trawlers and drifters. 50,000 RN personnel were involved in operational Mine Countermeasures. The British had continued to develop mine sweeping systems between World Wars I and II. When war came in 1939, the British had the most efficient and largest wire mine sweep in the world. The Oropesa Mk 1 was swiftly followed by the Oropesa Mk 2, a smaller single-ship wire sweep capable of being towed by small craft. Early in the war the Germans laid the 'Falmouth Field', the first offensive mine field against the UK. The UK had developed 'k cutters' (static cutters with sharp jaws) for wire sweeping but when they swept this minefield they found the Germans had planted sweep obstructors and delayed action mines to thwart their efforts. The first German laid magnetic mine was recovered by Lt Cdr John Ouvry RN on 23 November 1939. This resulted in the British development of magnetic mine sweeping. In the first development, the 'M' sweep carried 34 magnetized bars towed on pendants 40 feet long and spaced 15 feet apart. The M Mk 2 sweep carried seventy 27 inch magnets spaced 10 feet apart across its swept path of 700 feet. Like the Mk 1 sweep, the Mk 2 was designed to sweep in the water column and not on the surface. The first operational magnetic sweep called the 'LL' comprised two cables of different lengths with electrodes towards their tail ends. A petrol-powered 35KW generator set and batteries pulsed at 3000 amps for 5 seconds each minute. This early magnetic sweep was not only used to clear British areas but was also used in cooperation with the French to clear German air-laid magnetic mines from the entrance to Le Havre at the beginning of WW II. This sweep led to the requirement for a buoyant magnetic sweep cable and its development. During this same period, the UK developed a 'Portable Pulsing Unit' designed to be placed on available craft-of-opportunity for clearing continental ports. Also known as the 'Portable Mine Destructor', it used the UK developed floating magnetic cable. In the summer of 1941, German submarines laid moored magnetic mines in water 600 to 960 feet deep. These mines could also be laid in as little as 90 feet of water. Because of these developments, the UK developed a single ship deep sweep. The test ship was HMS Fraserburgh, a Bangor class minesweeper. In 1943 when the invasion of Europe plan was being planned, attention turned to developing an amphibious assault sweep to the beaches. A shallow 'A' sweep was developed but was never used in operation. Additional testing was done on the Oropesa Mk 5 wire sweep and was found to be effective to a depth of as little as 10 feet. During the latter part of World War II, the British addressed the shallow water problem. Wooden motor mine sweepers were not safe against the more sensitive magnetic mines in less than 40 feet of water. 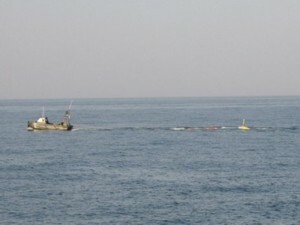 The earliest solutions were purely tactical and accomplished by first placing the tail before the mine sweeper using a small unmanned boat to tow the array ahead of the mine sweeper. Secondly they started at the edge of the channel using a programmed sequence. The 'A' sweep was used as a precursor and one or more mine sweepers following with a higher setting and a lower setting to improve clearance percentages. The first known use of an acoustic mine occurred in 1940. However work on an acoustic countermeasure had already been initiated by HMS Vernon and the Sweeping Division of its Mine Design Department. This resulted in the SA acoustic hammer box in the bow compartment of a vessel (usually a converted trawler) but later bow-mounted about 12 feet below the water. By 1942, the bow mounted hammer box was one of the most common acoustic countermeasures and was being streamed abeam, usually in combination with the LL magnetic sweep. The hammer boxes contained a pneumatic or electric driven riveting hammer mounted to strike against a 7/16 inch thick 19 inch diameter steel diaphragm. The pneumatic hammers proved more reliable than the electric type and were incorporated into the standard hammer box designated 'A Mark 1' which was either suspended over the bow of a minesweeper or towed in combination with the magnetic sweep. While Britain and Germany were active between the World Wars, their emphasis was different. Britain worked on mine development and mine countermeasures about equally. Germany spent much more of its energy on mines and mining but did not ignore mine countermeasures. German sweeping gear involved using two vessels together as well as single vessel sweeps. The Germans also used single vessel sweeps when employing convoy sweeping gear. Their bow-protection gear included otterboard and paravane protection gear and bow cutter gear. One of the faults with their early sweep gear was that it could only capture one mine at a time. The gear then had to be recovered and re-streamed. Germany had recognized the inherent disadvantages of the two ship sweep before the war but it took some time before single ships sweeps were sufficiently developed by the Kreigsmarine. The first single ship German sweep was know as O.R.G. (OtterRaumGerat). It was originally developed for use on the old larger mine sweepers (M boats and Fischdamphfers). While it was replaced by newer sweeps, the O.R.G. was used by the German Navy until the end of the war. During the war Germany also used two types of cutters for arming sweep wires. Their mechanical cutters included the RaumGreifer (R.G.r). Introduced in 1936, it required a speed of 12 knots and seemed to be effective against all mooring cables then in use. The DoppelGreifer (Double cutter) was half the weight of the R.G.r. and easy to handle. Another cutter, the Danube Cutter, was used as a special river sweep. The Germans used three classes of explosive cutters. The first were explosive claws such as the Type 'B' SprengGreifer (SP.GR). It was designed before the war for slow speed where mechanical cutters were not effective. The Type 'D' SprengGreifer was similar to the Type 'B' but larger and contained built-in safety devices. It was introduced about 1940. The EinzelschussigerGreifer was a single explosive cutter developed from the French F.L.R.G. sweep and used by the Germans from 1940. A double explosive cutter was the DoppelSchussigerGriefer. This sweep was also developed from the French F.L.R.G sweep. Both were effective against steel wire cable up to one inch thick. The third class was a special explosive claw known as the Type 'E' SprengGrieffer which was based on a Russian design developed for arming bow protection gear against the chain and claw obstructor used by British mine moorings. The moored minesweeping gear used by the Imperial Japanese Navy was generally inferior. Most of their sweeps were of the two-ship team type which exposed the sweepers to considerable risk. Also no cutters were used except mechanical types on the paravanes of the high speed single ship sweep. Serrated wire was used to some extent but apparently only on bow-deployed paravanes. Japanese sweep gear recovered during and after the war was found to contain many short lengths of wire, shackles, swivels and floats. When deployed, this made towing and recovery slow and difficult. Testing showed that control of sweep depth was "quite uncertain" and with some types, the variation in depth at towed speed was excessive. Most types of sweep gear were handed manually making deployment and recovery very difficult. 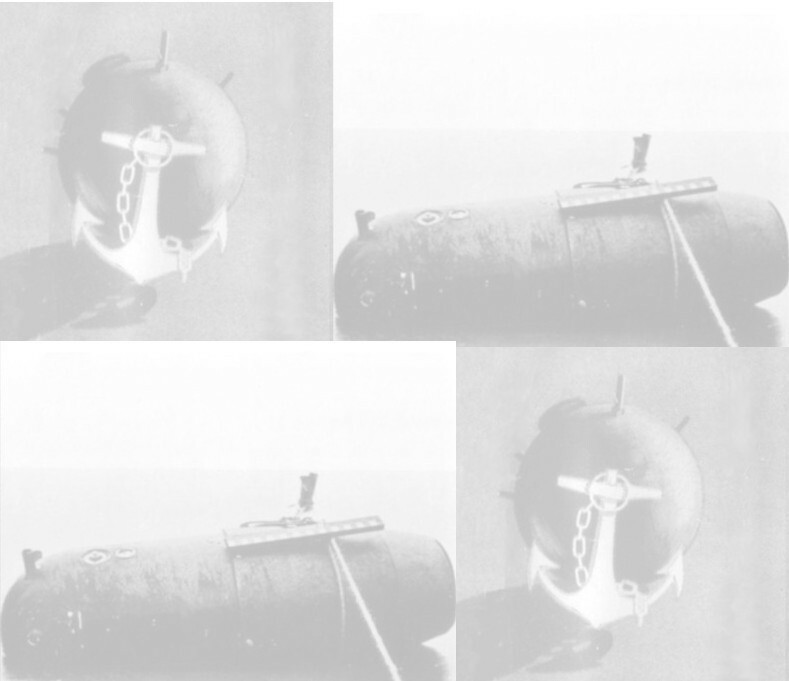 Later testing revealed some of the equipment lacked positive buoyancy so that the floats could crush if allowed to sink during recovery. Overall, the Japanese moored sweep gear was considered crude, clumsy, inefficient and slow. Japanese magnetic sweep gear comprised double catenaries towing magnets above the seabed or rigged to drag along the seabed. The only acoustic sweep used by the Japanese Navy at the end of the war was the sound bomb (Hatsuondan). The doctrine for its use varied. In general, groups of 3 to 5 were dropped with 2 minute intervals between bombs and spaced about 200 metres apart, as the sweep ship travelled at 4 knots. After the war the Japanese admitted that, at best, the sound bombs only swept about 50% of American acoustic mines. Prior to World War II, US Navy mine countermeasures languished. Before the establishment of the US Naval Mine Warfare Test Station at Solomons, Maryland, all mine and mine countermeasures work was done directly by the Bureau of Ships at various mine sweeping bases along the Atlantic Coast. The Solomons Facility consisted of one officer and one enlisted man but later increased to three officers and 5 enlisted men. The ships used in testing provided the bulk of required labour. Initially the major portion of the MCM work consisted of testing the development of explosive cutters. At the beginning of the war, the only cutter in the US Navy’s inventory for cutting chain moored mines was the 'T Mark II Cutter'. This cutter was prone to misfire and was never considered to be satisfactory. In 1943, the Safety Appliance Company began development of the 'Y' or Mark 12 cutter and testing was done at the new test station at Solomons, MD. After testing production began in 1944. However, further field testing showed the cutter was not acceptable. Changes were ordered that greatly improved its capabilities. The Mark 12 was then considered superior to any explosive cutter then in use. Magnetic sweeping development was undertaken by two groups. The Timer Laboratory worked on electrical and mechanical problems. A special 540KW diesel generator was installed on a YMS class vessel. At Timer Lab, a duplicate power and generator set was installed. This group did all the original cable splicing for the countermeasures department in 1943. A second group, organized in 1944, was directly concerned with the development and testing of magnetic mine sweeping gear. Also, during late 1942 and early 1943, personnel from the Bureau of Ships tested two magnetic spar sweeps, the M Mark 1(a) and the M Mark 1(b). Both were designed for sweeping in restricted and shallow water areas. The Bureau of Ships also developed a two ship catenary sweep, the 00 M Mark 4(a). Later the M Mark 5 became the standard Navy magnetic sweep. The advent of sensitive horizontal induction mines, required the development of even newer magnetic sweeps. After the M Mark 5, the US Navy tested the 'J' sweep or M Mark 6(a). The 'J' sweep was formed by diverting the long leg of a standard sweep tail with minesweeping gear. This configuration produced an asymmetrical field with desirable characteristics. The need for a shallow water sweep led to the use of a 50 foot motor launch which was later replaced with a 36 foot landing craft. A non-buoyant 300 metre MCM cable was used with floats. A small craft M Mark 6(a) type sweep was developed using size 5 or size 4 'O' gear for cable diversion. A small craft M Mark 4(d) sweep was also developed. At the same time degaussing experiments were conducted on a 36 foot landing craft. A technique was developed for degaussing these landing craft modified into shallow water minesweepers with a signature of 4 millgauss at 8 feet. In 1945 experiments were started on a closed loop modification of the M Mark 6(a). This was done by removing the electrodes and completing the circuit with a length of insulated 300 MCM cable. Two groups developed acoustic countermeasures, Gear Development and Laboratory Measurements. Emphasis was placed on hammer boxes and towed pipe gear since these were the types of acoustic gear used on minesweepers. During the winter of 1942-1943, the US Bureau of Ships was assigned the task of improving the British spring hammer. The first improved model was ready by July of 1943, known as 'X-31'. Testing began and, after several modifications, was ready. The X-31 was designed to be towed rather than mounted on a boom. In early 1944 testing started to develop a simple towing arrangement. Use of a small fin and depressor attached to the box with a suitable bridle gave acceptable results at speeds of 10 to 12 knots. Later a streamlined housing was developed that allowed tow speeds of up to 15 knots. This streamlined version of the spring hammer was designated A Mark 4(v). By November of 1944 tests began on low speed gear designated A Mk 2. Towed using hinged strikers, this gear met the requirements for acoustic output but only had am operational life of 4 to 14 hours when towed at 7 knots. Further modifications increased its life and later modifications followed. A medium speed sweep of 7 to 10 knots and a high speed sweep 15 knots were examined in the late 40's. Project AG-39 was established by the US Bureau of Ships on 17 December 1944 to test the production units of the A Mark 6(b) gear. The first units were tested to determine the acoustic output characteristics. This data was to include measurements of output vs. frequency, output vs. motor current, and output variation of line voltage. Towing tests of the A Mark 6(b) gear were first conducted in early March 1945. Both the British and Germans experimented with explosive sweep gear. Generally an explosive sweep consisted of a series of timed small underwater explosions. 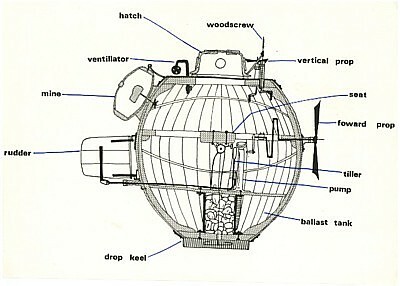 Because of undesirable features in the British explosive gear, the US Navy designed a modified explosive sweep with several improvements. This 'grenade sweep' was designated the A MK 5(b). Testing against acoustic mines showed that the size of the grenades and the time intervals between explosions proved critical against each mine tested. The British tested a hydraulic siren as an acoustic device early in the Second World War but the results were less than promising. At the same time , the Germans had produced a towed hydraulic siren. A US Navy project was started in 1945 to test a siren against acoustic mines. This version proved successful. It was compact and used a portable fire pump to push water out a tubular stator broken up by the rotation of a cup turned with compressed air. Because of the use of water and air it became know as 'water air powered underwater siren' or WAPUS for short. Interestingly, later improvements made it possible to eliminate the compressed air supply but the name remained. In the spring of 1944 the US Bureau of Ships requested a sweep for the German 'Oyster' pressure mine. The discovery of pressure mines during the Normandy invasion made this a very urgent project. A towed canvas shape with a large hole in the front and a small hole in the rear was suggested. It was soon referred to as the Loch Ness Monster'. The original design was about 180 feet long and 24 feet in diameter at its largest circumference and was calculated to displace about 2200 tons of water when full. The canvas did not last long but 'Nylon', a new material first thought to be too light weight, was found to work well. With the advent of the nylon units, testing began in the autumn of 1944. Test data revealed the results were not acceptable. A larger unit was made (over 200 feet long and 32 feet in diameter) and tested at a maximum speed of 4 knots. While the signature was acceptable the swept path was not very wide. In 1943 the Sweep Test Division C-4 was organized. The original complement consisted of 12 officers and nine enlisted men, all of whom were inexperienced in mine countermeasures. Only one officer had attended the Mine Warfare School, then located at Yorktown, VA. By early 1944 the US Navy began to look at, and record, the acoustic output of its own ships. A series of hydrophones were set up and ships run over the course in both directions. QUEBEC - an unprotected echelon formation employing combination influence sweeps or moored sweeps. In the 1950s the Oropesa Mk 2 mechanical sweep was followed up by the Wire Sweep Mk 3 (WS 3) fitted in the 47 metre Ton Class Coastal Minesweepers (CMS, later designated MSC) that gradually replaced the WW II vintage minesweepers in RN service and elsewhere. This sweep was fitted with explosive T Mk 8 cutters and could be streamed by a ship as a single Oropesa from one quarter or as a double Oropesa with a wire streamed from each quarter. This sweep could also be used as an Armed Team Sweep (ATS) where 2 or more sweepers were linked together. A Deep Armed Team Sweep (DATS) could be achieved using the larger 'Algerine' kite to depress the sweep. Influence sweeping was achieved in the Tons using the Combined Towed Acoustic Sweep Mk 1 (CTAS 1) and Loop. 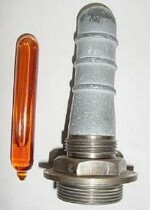 This comprised an Acoustic Hammer (AH) and/or an Acoustic Displacer (AD) and a pipe noisemaker each of which produced different acoustic frequencies towed in combination with the Magnetic Minesweep Mk 11(L) (MM 11(L)) loop The gear could be configured in different rigs including the streaming of acoustics abeam. More usually, acoustics were streamed astern of the ship with the loop. In December 1979, HMS Brecon was accepted into service as the first of 13 larger 60 metre Hunt Class of Coastal Minehunter/Minesweeper (MHSC). The Hunt Class is fitted with a non-magnetic mechanical sweep called the Wire Sweep Mk 8 (WS 8) with Swedish 'S' explosive shaped charge cutters replacing the elderly T Mk 8 version. This can be streamed as a single ship Oropesa sweep or as a Team Sweep between two or more sweepers. It also has the Combined Influence Sweep (CIS) which comprises the Minesweeping System (Acoustic) Mk 1 (MSSA 1) and the Magnetic Sweep Mk 14 (MS 14) loop. MSSA 1 uses a Towed Acoustic Generator (TAG) as its noise source and can be used in the closed loop configuration with the Towed Acoustic Monitor (TAM). This allows the system's combat management system to adjust its output settings based on feedback from the TAM. In 1984, the first of the 12-strong River class of Fleet Minesweepers (MSFs) was introduced into service for the Royal Naval Reserve (RNR). This was equipped with the Wire Sweep Mk 9 (WS 9) which was capable of performing Extra Deep Armed Team Sweeping (EDATS) when paired with another ship of the same class. The River Class only remained in service for a few short years before being sold off. In 2003 during the Iraq War, the UK developed and deployed the Shallow Water Influence Minesweeping System (SWIMS) as an 'Operation Telic' Urgent Operational Requirement (UOR). This was used to help clear the Shatt Al Arab, the Khawr Abd Allah river and the approaches to Umm Qasr and allow the passage of RFA Sir Galahad, the first ship to carry humanitarian supplies into an Iraqi port. Combat Support Boats, controlled remotely from MCMV mother ships, towed the Australian Defence Industries (ADI) Mini Dyad System (MDS) and Pipe Noise Makers ahead of the RN minehunters as precursor sweeps against ground influence mines. Early attempts at minehunting were made by the UK in the 1950s and 1960s. One system trialed was the Magnetic Towed Gradiometer (MTG). This employed a string of magnetic sensors towed across the seabed. When a metallic object was detected, a trace was made by the appropriate sensor's pen on a paper roll on board the ship and a marker buoy could be released. It soon became obvious that this system had severe limitations and more efforts were placed on the use of sonar for detecting mines. 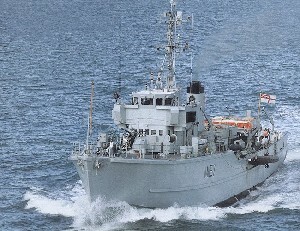 In 1964 HMS Kirkliston became the first Ton Class MCMV to be converted into a Coastal Minehunter (MHC). She was fitted with the Minehunting System (Acoustic) Mk 1 (MHSA 1). This comprised the Plessey hull-mounted minehunting Sonar 193 and the Interim Navigation System Mk 1 (INS Mk 1). The INS Mk 1 included a Mk 20 plotting table on which a projected circular graticule was driven by an operator who manually 'strobed' the radar echo of a short scope buoy using a cursor on his radar set. The geographical position of the short scope buoy had been established as accurately as possible and sonar contacts were plotted on a tracing paper 'roller plot attachment' according to their range and bearing from the ship as represented by the centre of the moving graticule. The identification and disposal of mines was achieved by a clearance diving team. This was 'conned' on to the sonar target by matching the echo of the sonar reflector suspended beneath their dinghy with the echo of the 'minelike' contact on the sonar display. Tons converted for minehunting had their influence minesweeping systems removed but retained their Oropesa mechanical sweeps. The 13-strong Hunt Class MHSC is fitted with the Minehunting System (Acoustic) Mk 2 (MHSA 2). This comprises the hull mounted minehunting Sonar 193M (Mod 1), the Ferranti FM 1600B Computer Aided Action Information System (CAAIS) and ECA Poisson Auto Propulsé 104 (PAP 104) bottom-following Remote Controlled Mine Disposal System Mk 1 (RCMDS 1) for mine identification and disposal. While short scope buoys are provided for navigation, GPS satellite navigation system is usually employed these days. A clearance diving element is still embarked as an integral part of the weapons system. Most recently (2004), HMS Hurworth has been fitted with a new hull-mounted minehunting Sonar 2193 using wideband technology that effectively doubles the ranges and resolution provided by Sonar 2093. 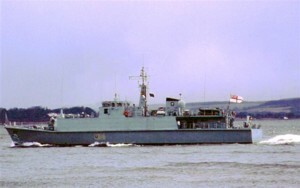 In 1988, HMS Sandown, the first of the 12-strong Sandown Class of Coastal Minehunters (MHCs) entered service with the RN. The Sandown Class is fitted with the Minehunting System (Acoustic) Mk 3 (MHSA 3) which comprises the Variable Depth Sonar 2093, NAUTIS(M) Command Information System and PAP 105 adjustable-depth Remote Controlled Mine Disposal System Mk 2 (RCMDS 2) for the identification and disposal of mines. A clearance diving element is still embarked as an integral part of the weapons system. 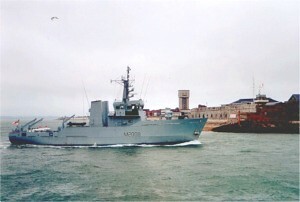 Many other types of MCMV have seen service in the Royal Navy since WW II including Ham Class inshore minesweepers, Ley Class inshore minehunters, minesweeping trawler conversions HMS Venturer & HMS St David and HMS Pict and the Northella Class minesweeping trawler conversions that saw service in the Falklands. Experimental minesweeping and minehunting trials were even conducted with various types of hovercraft and the Boeing hydrofoil HMS Speedy. In 2004, the Hunt Class MHSC HMS Chiddingfold was the first ship fitted with Sonar 2193, a hull-mounted wide-band minehunting sonar providing far greater ranges and resolution than its predecessors. This system, combined with the new NAUTIS 3 Command Information System, will ensure the Royal Navy remains at the forefront of MCM capability for the foreseeable future. Even before World War II ended, US Navy minesweepers had been active in the China Sea sweeping mines laid by the Japanese. The most difficult mine to sweep then and now is the pressure mine. The US Navy used Victory and Liberty ships outfitted with remote control engine rooms and a minimal crew. During missions the small crew was confined to the bridge with standard mattresses piled on the floor and secured to the deckhead to protect the crew if a pressure mine exploded. This was dangerous duty and the US Navy depended on all volunteer crews to man these ships. When the Korean conflict began in June 1950 the US Navy had virtually no minesweepers available. Most of the mines found early in the conflict were old Russian mines dating from the 19th Century Russo-Japanese War that were given to North Korea by the Russians. Most of the sweepers that that took part were former YMSs that had been converted to named minesweepers. It was during this time the Mine Sweeper Ocean (MSO) program was initiated by the US Navy. More than 40 of these ships were built and used until the mid-1980s. The mine countermeasures role in Vietnam began in December 1961 when several ocean going sweepers (MSO’s) were ordered to patrol with Republic of Vietnam ships. In August 1965, four small minesweeping boats were deployed to Da Nang and worked the rivers looking for shallow water mines. The MSBs were equipped to sweep magnetic, moored, or bottom mines. The Viet Cong also laid crude mines that could be activated from a shore location. To counter them, the MSBs carried a drag chain fitted with hooks - very dangerous work indeed. If the cables were not ripped out by dragging, the VC could fire the mine after it was hooked by the MSB. In 1964 the US Navy tested a new sweep known as the Mark 101 Mod 0 Low Drag Moored Minesweeping Equipment called VERMOOR. This sweep was designed to be carried in, deployed, towed and recovered by specific helicopters. When deployed as a two-sided sweep it had a maximum weight of 789 pounds including the tow wire. VERMOOR’s advantages were that its component parts were relatively light-weight and ease of handling. With the introduction of the Avenger class MCM ship in 1985, the US Navy introduced two new navigation systems. The AN/SSN-2 Precision Intergrated Navigation System (PINS) was placed on the MCMs and the AN/SYQ-13, placed on the later introduced Osprey Class (MHC) coastal minehunters. With these systems, the ability to navigate and track position was taken to a new level. The requirement for a highly precise navigation suite is important in that it allows the hunting or sweeping mines with less overlap. The less overlap, the faster the target area can be swept. The MCM and MHC ships also have the new AN/SLQ-48 Mine Neutralization System (MNS) allowing the ship to deploy a tethered remotely operated vehicle that can look at a mine with high frequency sonar, view the object with an on board camera, and drop a bomblet that can be fired remotely. Other combat systems shared by these two new mine countermeasures ships are the AN/SQQ-32 digital variable depth sonar, the AN/BQH-7a Bathythermograph, the AN/WQC-2a underwater communications, and the AN/UQN-4a sonar sounding set. Even today, many nations realise the importance of having a mining capability and a mine clearance capability. The Belgian Navy is currently developing a new class of MCM ship with the ability to sweep mines using a new influence system. The Royal Danish Navy, with its limited budget, has developed a new class of multi-mission ships with MCM capabilities. They are designed to both hunt and sweep mines and can be converted to mine layers or to perform other naval missions. The Royal Swedish Navy has also developed a second generation self-propelled influence sweep system based on lessons learned from their acoustic magnetic (SAM) program. The United States Navy is also looking at new types of sweep gear. Testing has been completed on the Advanced Light Weight Sweep System, called ALISS and the success of that advanced concept technology demonstration program holds promise for the future. The US Navy has also tested various foreign systems such as the the Royal Australian Navy’s DYAD system and that too, may hold a future in US and other naval inventories. Allied Minesweeping in World War II by Peter ElliotAmerica's use of Sea Mines by Robert C. Duncan Ph.D.